It’s mid winter here in Southwest Florida. So far, it seems like the weather can decide what it wants to do. Overall, it’s been quite mild temp wise, but frequent cool fronts have kept local water temps from spiking above 70 degrees for much longer than an afternoon. Winter fishing can be slow at times and ultra clear water clarity can have snook and redfish quite spooky if winds are light. I’ve heard several reports of large numbers of snook stacking up along the outside walls of Pine Island Sound and Matlacha Pass Eastern shorelines. Fish will be concentrated near creek mouths, dark mud areas and occasionally along clean sand bars adjacent to deepwater. Live baits (white bait if you can find it) tend to produce the best numbers of fish. Delicate presentations with small soft plastic jigs and minnow baits can draw strikes when presented properly. Juvenile tarpon are available in residential canal systems, although getting them to bite can be challenging to say the least. 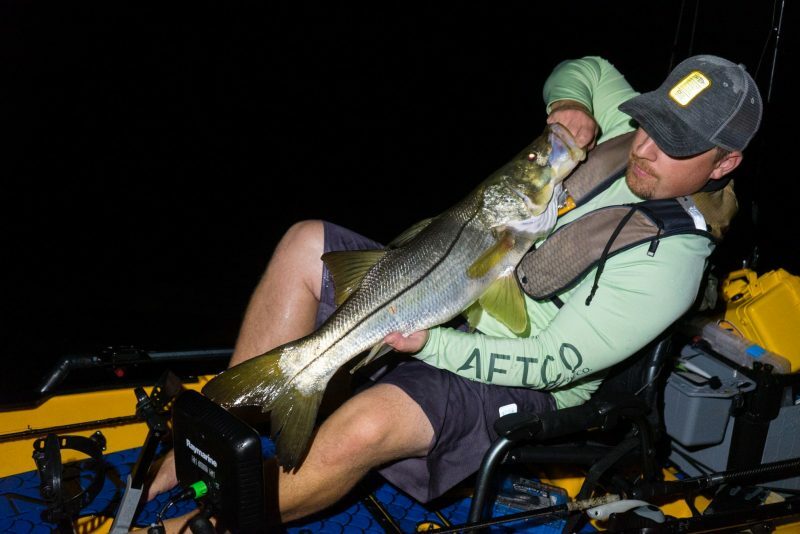 Night fishing can be hit or miss for snook and tarpon. Find a night with light winds after a couple days of warm weather and they may be on the chew. Check deep water areas near structure using large HDUV Jigging Hogy Soft Baits. 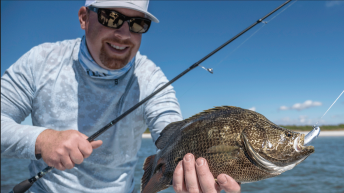 Knocking baits into structure and making some noise can draw strikes from resident Goliath Grouper and over slot snook. If you manage to hookup, you’ll notice that fish are a fair bit easier to land in the cooler water. Make sure to handle them gently and offer a longer recovery time for a healthy release. Tarpon Alert: On a recent outing, two adult tarpon in the 110 – 120# range were hooked with unweighted Hogy Lures Original Series Baits. A small pod of adult tarpon was feeding heavily on 3-4″ ballyhoo on a fast moving incoming tide. Both fish were quite silver without any dark coloration of being a residential river fish. Water temps were 66.5 degrees. For what it’s worth, I just jumped a large tarpon (100# class) inside New Pass this morning jigging for trout with an 1/8 oz maribou jig tipped with shrimp!!! Lost him on the 6th jump. Thought you might be interested to know. That’s awesome. Surprise fish are very memorable. I figured they would be showing up this week with the high temps and southern wind.